UPDATE: See end of blog post. Over the last cou­ple of decades it has been pop­u­larised in a wide vari­ety of sources, and gen­er­al­ly attrib­uted to Calvin’s works on Deuteronomy. It is under­stand­able why it has become pop­u­lar: it is polem­i­cal, express­es a cen­so­ri­ous sen­ti­ment that is abhor­rent to mod­ern ears, and does it with a degree of vit­ri­olic rhetoric that grabs the atten­tion. On that basis it gets trot­ted out reg­u­lar­ly to sup­port issues of reli­gious cen­sor­ship such as this piece from the ABC on the Zaky Mallah/QandA affair: http://www.theage.com.au/comment/the-abc-wasnt-wrong-to-have-zaky-mallah-on-qa-20150623-ghvaow. 1 However, the major­i­ty of these sec­ondary works, if they cite any­thing at all, refer not to any work by Calvin, but to oth­er sec­ondary lit­er­a­ture. 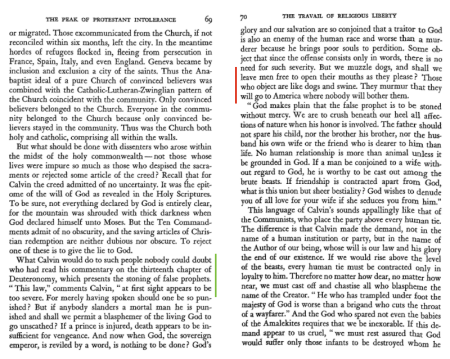 In the text this quote has no end­ing quotemark, although the next para­graph starts with a fur­ther quotemark, and so one may pre­sume that these words are intend­ed to be cit­ed as a quote from Calvin, espe­cial­ly as the open­ing quotemark on page 69 reads ‘“This law,” com­ments Calvin “at first sight…’ It is rel­a­tive­ly safe to take the under­stand­ing that Bainton is intend­ing to quote Calvin at this point. 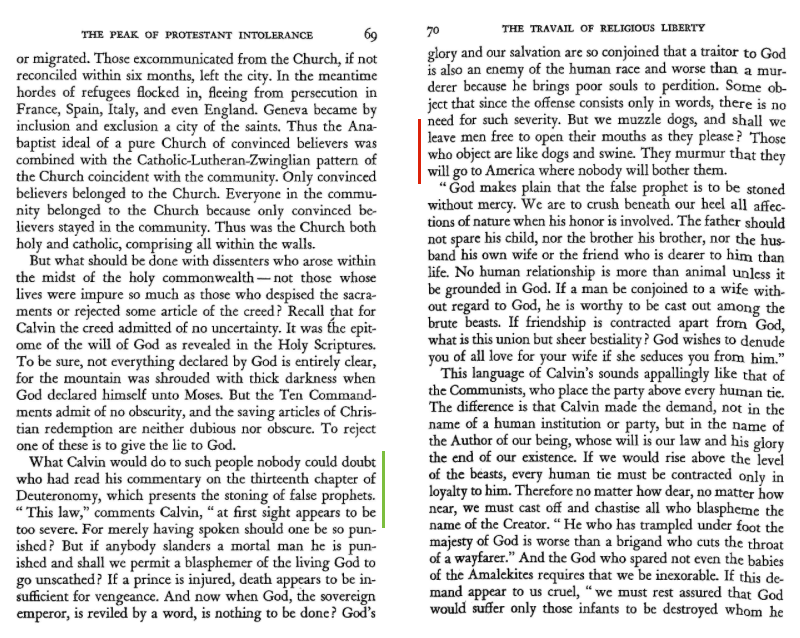 From this the nat­ur­al ref­er­ence for Bainton is that of Calvin’s words on Deuteronomy 13. However, here lies the mul­ti-faceted prob­lem. Firstly, in the ref­er­ence edi­tions of Calvin’s com­men­taries, there is no dis­tinct com­men­tary on Deuteronomy. Rather there is a com­men­tary on the Harmony of the Law, which con­tains many of his words on Deuteronomy. It would be a rea­son­able expec­ta­tion to find this quote in the Harmony of the Law when Calvin deals with Deuteronomy 13, and it was my first port of call, but there is noth­ing there. I can find no ref­er­ences to dogs, can­is, and muz­zling can be found in any of the ver­sions of the work I have looked at (the work from the Calvin Translation Society is the pri­ma­ry ref­er­ence here). The sec­ond loca­tion to search was that of the Institutes, as Calvin occa­sion­al­ly draws upon var­i­ous pas­sages and pro­vides a mini-com­men­tary to sup­port his points. Again no ref­er­ences to muz­zling dogs may be found in any of the four edi­tions of the Institutes that I referred to. 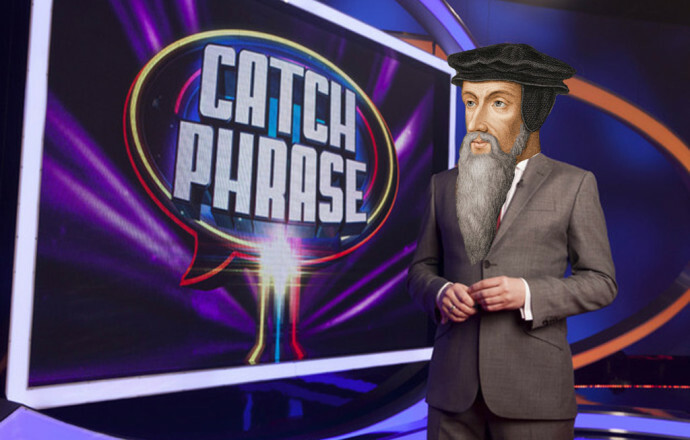 In this ser­mon, and the ser­mon preached in the fol­low­ing week, Calvin does talk about dogs and swine (dogges and ſwine) in a few places. However, all but one are paired as ‘dogs and swine,’ while the final ref­er­ence is to the Papists and Cardinals as being dogs. Throughout his ser­mons on Deuteronomy I can find no ref­er­ence to muz­zling at all. These three loca­tions form the core of the mate­r­i­al that Calvin wrote or preached on Deuteronomy. But in case I was miss­ing some­thing I also ran search­es for ‘muz­zling’ and ‘dogs’ through­out all of the resources I could find elec­tron­i­cal­ly (the Calvini Opera, Archive.org, CCEL, StudyLight etc pro­vid­ed ample resourc­ing). Logos, DevonThink, were used for basic search­es and a cus­tom LSA 6 cor­pus was used to see if any infer­ences and alter­nate­ly trans­lat­ed words could be detect­ed. None of these search­es returned any sig­nif­i­cant results, with the major­i­ty of hits being those found in Calvin’s ser­mons on Deuteronomy 13. All in all I can­not find any ref­er­ence to the core of the orig­i­nal quote regard­ing muz­zling dogs any­where in Calvin’s works. At this time the prime set­tle­ments in America were Catholic in nature. The only ref­er­ence to a Protestant site that I can find is that of Charlesfort-Santa Elena in South Carolina, the site of a Hugenot set­tle­ment. However, apart from this failed set­tle­ment where may this American set­tle­ment refer to. Indeed if, as Bainton is argu­ing, this quote is refer­ring to Protestants flee­ing Europe over per­se­cu­tion (Bainton lat­er links the Michael Servetus inci­dent here), then it would make no sense to flee to a loca­tion that was expe­ri­enc­ing sig­nif­i­cant reli­gious per­se­cu­tion if they want to go some­where where ‘nobody will both­er them.’ This sen­ti­ment fits far bet­ter in the ear­ly-17th cen­tu­ry, rather than the mid-16th cen­tu­ry. This his­tor­i­cal tan­gent aside, what do we make of this quote? Certainly if one wants to con­vey the sen­ti­ment of reli­gious per­se­cu­tion and debate, a case may be mount­ed from Calvin’s works. But I would argue that this quote is not a reli­able source for it. I still can­not find any ref­er­ence to the quote, nor any sig­nif­i­cant mate­r­i­al on flee­ing to America, in any of Calvin’s works. I have enquired with some Calvin schol­ars to no avail—or with some no reply. Therefore I am turn­ing to the broad­er inter­net, if any­one can sup­ply the loca­tion of the quote I would be very inter­est­ed. It appears that in my prej­u­dice for trust­ing the valid­i­ty of phys­i­cal books over archive.org scans I had missed that Travails has its sourc­ing in end notes after the final chap­ter. Unfortunately the copy that I had sourced from a local library was rebound and miss­ing the sources and index at the end of the book. Thanks to Richard Walker for high­light­ing this to me, see his Disqus com­ment for more details (unless Disqus isn’t load­ing again). However, I’m still not con­vinced by the trans­la­tion that Bainton has sup­plied and will blog on that lat­er.